WE take a look at the Istanbul Park circuit ahead of Sunday's Turkish Formula One Grand Prix. No, you're not seeing things, the cars are going the wrong way. 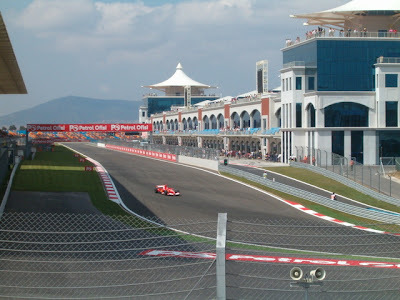 Turkey differs from the majority of races on the F1 calendar in that it is one of just a few races in which the lap runs anti-clockwise. The circuit is designed by renowned German architect Hermann Tilke - the man behind the Sepang, Bahrain and Shanghai tracks - was purpose-built and made its debut on the Formula One calendar in 2005. It features 14 turns and has plenty of gradients, meaning there may be fewer obvious overtaking opportunities than some of the circuits we've already seen this season. But there'll still be ample speed, with cars reaching speeds of up to 330 km/h.